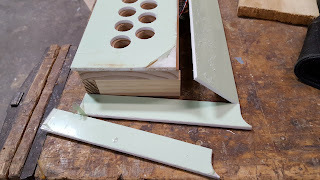 One hole in the plastic was missed so it had to be drilled out. This hole was marked by placing the wood over it as a template and tracing the circle that was supposed to be cut. Drilling the hole, which previously relied on a center-mark, was estimated and drilled according to the edges of the drill bit. It turned out well. Wood-insert nuts were purchased for this project. Holes were drilled for them previously but the nuts weren’t on hand. This type used a straight-blade screwdriver to put the nuts into the wood. A hex wrench version was also available. 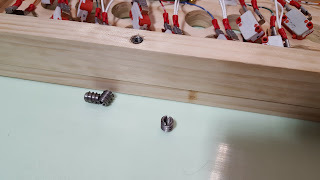 Next time the hex wrench versions will be used since it was difficult to guide the nuts along a perpendicular line while installing in soft wood. The sheet of plastic was trimmed to match the size of the button board. The type of plastic wasn’t identified when it was purchased but it could have been HDPE, High-Density PolyEthylene since the edges cut very smoothly but it wasn’t as pliable as nylon.